A SUNDAY TIMES HISTORY BOOK OF THE YEAR 2017 'A brilliant, compelling, propulsively written, magnificent tour de force' Simon Sebag Montefiore, Evening Standard 'The second volume of what will surely rank as one of the greatest historical achievements of our age ... The War and Peace of history: a book you fear you will never finish, but just cannot put down' Dominic Sandbrook, Sunday Times Well before 1929, Stalin had achieved dictatorial power over the Soviet empire, but now he decided that the largest peasant economy in the world would be transformed into socialist modernity, whatever it took. What it took, and what Stalin managed to force through, transformed the country and its ruler in profound and enduring ways. Rather than a tale of a deformed or paranoid personality creating a political system, this is a story of a political system shaping a personality. Building and running a dictatorship, with power of life or death over hundreds of millions, in conditions of capitalist self-encirclement, made Stalin the person he became. Wholesale collectivization of agriculture, some 120 million peasants, necessitated levels of coercion that were extreme even for Russia, but Stalin did not flinch; the resulting mass starvation and death elicited criticism inside the party even from those Communists committed to the eradication of capitalism. By 1934, when the situation had stabilized and socialism had been built in the countryside too, the internal praise came for his uncanny success in anticapitalist terms. But Stalin never forgot and never forgave, with bloody consequences as he strove to consolidate the state with a brand new elite. Stalin had revived a great power with a formidable industrialized military. But the Soviet Union was effectively alone, with no allies and enemies perceived everywhere. The quest to find security would bring Soviet Communism into an improbable pact with Nazi Germany. But that bargain did not work out as envisioned. The lives of Stalin and Hitler, and the fates of their respective countries, drew ever closer to collision. 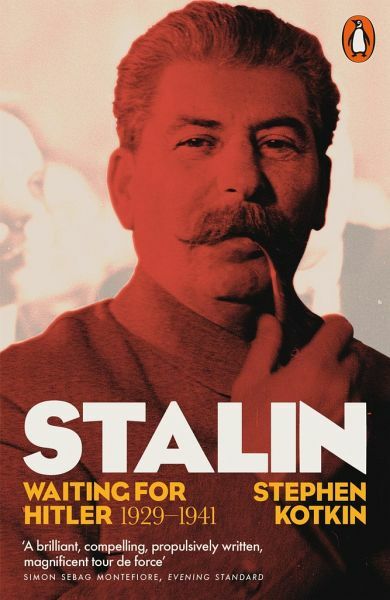 Stalin: Waiting for Hitler: 1929-1941 is, like its predecessor Stalin: Paradoxes of Power: 1878-1928, nothing less than a history of the world from Stalin's desk. It is also, like its predecessor, a landmark achievement in the annals of the biographer's art. Kotkin's portrait captures the vast structures moving global events, and the intimate details of decision-making. Stephen Kotkin has a fair claim to be considered as the greatest living expert on Stalin. He is the author of the highly-praised Stalin: Paradoxes of Power, 1878-1928 and Magnetic Mountain: Stalinism as a Civilization and Armageddon Averted: The Soviet Collapse, 1970-2000. He is Professor of History at Princeton University.